Between 1500 and 1620, at least 50 Europeans had died while exploring the New England area and countless fisherman had anchored on Georges Bank to fill their holds with fish to be eaten during Lent in Catholic Europe. Occasionally a ship's captain would kidnap some Native Americans. For example, Squanto, whom we know as the interpreter for the Plymouth Colony, was captured in 1614 and taken to Europe and sold as a slave. Somehow he was freed from slavery and made his way to England. He signed on as a pilot for a voyage of exploration to Newfoundland sometime between 1618-1620. From Newfoundland he made his way back to his home and was present at Plymouth in 1620 when the Mayflower landed. Some of these explorers who sailed to the northeast coast of North America were John Cabot (1497) sailed for England, Giovanni da Verrazano (1624) for France, Estevan Gomez (1525) for Spain, Jehan Allefonsce (1542) for France, Sir John Hawkins (1562) for England, Samuel de Champlain (1605) for France, Henry Hudson (1609) for England and in 1613 Adriaen Block for Holland. The Dutch were interested in establishing trading posts in the Hudson River area. Adriaen Block was hired to investigate and trade for furs. In 1613 he and another Dutch fur trader were on their way back to Holland with a cargo of furs when Block's ship, the Tiger, caught fire and was destroyed at the mouth of the Hudson River. 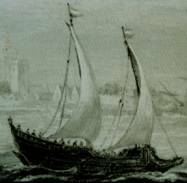 The two captains and their crews constructed huts in which to overwinter on Manhattan Island while they built a new ship for Block (much like the one pictured above), a 45 foot, 16-ton vessel, the Onrust (the Restless). The trial voyage of this new ship was in the spring of 1614 when Block sailed through the East River and the whirlpools he so aptly named Hellegat (Hell Gate) and into Long Island Sound. It is here, in Long Island Sound, that the only reminder of this explorer remains -- Block Island. In the course of this voyage, Block became the first recorded European to explore the Connecticut River, sailing 60 miles up the river, past present day Hartford, probably as far as the rapids at Enfield. According to Howe (1969) , Block wrote, "Next, on the same south coast, succeeds a river named by our countrymen Fresh River, which is shallow at its mouth ... . In some places it is very shallow, so that at about fifteen leagues [between 30-60 miles] up the river there is not much more than five feet of water. There are few inhabitants near the mouth of the river, but at the distance of fifteen leagues above they become more numerous ... . The depth of water varies from eight to twelve feet, is sometimes four and five fathoms [24-30 feet], but mostly eight and nine feet. The natives there [South Windsor] plant maize, and in the year 1614 they had a village resembling a fort for protection against the attacks of their enemies. ... The river is not navigable with yachts for more than two leagues farther, as it is very shallow and has a rocky bottom. ... This river has always a downward current so that no assistance is derived from it in going up, but a favorable wind is necessary." Block sailed up the Connecticut River in the Spring. Was he fighting against the Spring freshet? Captain Block returned to Holland with the good news that fur trading was a very real possibility. Over the next few years, trading between the Dutch and the Indians was established. In 1624 the Dutch built a settlement in New Amsterdam (New York) and a trading post on the Connecticut River, calling it Kievits Hoek (soon to be abandoned). By 1633 the Dutch had acquired land from the Indians in present day Hartford on which they built a fort and a trading post (the House of Hope). Approximately 8,000 Indians lived along the river from its mouth up through Massachusetts. They lived in areas that had been cleared and cultivated for generations and were situated at favorable spots along the river. 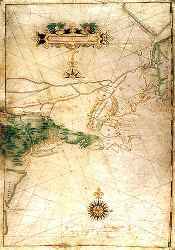 The Dutch, who founded New Netherland and the city of New Amsterdam, extended their explorations and traffic east, west, north, and south. They even went as far as Narraganset and Cape Cod bays in search of the beaver and otter. As Captain Block had discovered the Connecticut River and named it the Fresh-Water, and had looked into Narraganset Bay, the Dutch felt that they had a legal claim upon those regions according to the English doctrine concerning the right of discovery. So early as 1623, the agent of the Dutch West India Company seems to have taken possession of the Connecticut River and the lands drained by its tributaries, in the name of the Company and of the States-General of Holland. A peaceful and profitable trade might have been carried on with the natives of the Connecticut Valley, by the Dutch, had not the latter exasperated the Indians by the seizure of one of their chiefs and demanding a heavy ransom for his release. The savages threatened the intruders with violence, and the Dutch began to build a stockade fort for their own protection, at what is yet known as Dutch Point, near the City of Hartford. Wrath prevailed a long time. At length the Indians were pacified, and at their request the Dutch abandoned the fort. During the years 1611 through 1614, Capt. Adriaen Block in company with Captains Hendrick Christiansen and Cornelius Hendricksen extensively explored the area of eastern North America claimed by the Dutch as New Netherland. This area, based upon the 1609 voyage of Captain Henry Hudson and his search for the elusive Northwest Passage, was defined as between the latitudes of 38 and 41 north, or roughly between Delaware Bay and Cape Cod. These three sea captains and their crews, in individual vessels, carefully explored and charted the coast line and into the interior of the country via the Delaware, Hudson and Connecticut Rivers. The potential of the region for commercial exploitation of its resources, and particularly the rich fur trade with the natives, was carefully noted and fortified trading posts were established at present Albany and Manhattan Island. One of the most-historically important results of this exploration was the so-called "Figurative Map Of Capt. Adriaen Block". This map details the area of the 1611 - 1614 explorations plus the collective knowledge of the time. It was published after the return of Capt Block to Amsterdam in July of 1614. On October 11, 1614 this map was part of a petition presented to the States General of the Dutch Republic by Block, Christiansen and twelve other Dutch merchants for a charter of trading privileges for their newly formed United New Netherland Company. The three year exclusive trading charter that was granted on this date specifically references the "Figurative Map" and accepts its first historic mention of the area as "Niew Nederlandt". This map is also amazingly accurate, considering the limitations of the available survey and navigational instrumentation of the time. The details not only of the coastline but to a considerable depth into the interior of the country is indicative of early activities of which we have very little detailed knowledge or appreciation of today. It can be safely assumed that the information imparted by this map not only details the discoveries of Block, Christiansen and Hendricksen but includes the accumulated knowledge of the time.